Thermal Energy Storage (TES) technologies are used in buildings and industrial processes as a way of optimizing cooling systems and reducing energy demand. These kinds of technologies are extremely relevant in the medium and long-term for improving the world’s current and future situation in terms of pollution and electrical consumption. Although Thermal Energy Storage is a classic and fine-tuned approach to cooling, new trends in energy storage systems are constantly developing. ARANER makes sure our customers are always using the most cutting-edge methods and systems in cooling and energy storage. At ARANER, we believe that innovation in TES technology is the only way to optimize and reduce the economic and energetic cost of a wide variety of processes. Read further to discover some of our current Thermal Energy Storage technologies available in the market! ARANER is leading the industry in Thermal Energy Storage, which give us a series of advantages in terms of security and experience. In fact, ARANER has built the world’s largest thermal energy storage system. 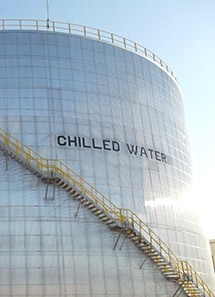 Our leading technology is the Thermal Energy Storage Tank, which stores chilled water that has been produced during off-peak hours, thus reducing operational/capital costs and capacity of the cooling plant. Not to mention greater energy efficiency and power augmentation! The benefits of this one-of-a-kind system are numerous. Natural stratification is our most popular tank choice due to price and simplicity. In this type of tank, gravity does all the work; cool water settles naturally at the bottom of the tank due to its greater density, while the less dense warm water stays at the top. They’re stored together without a physical barrier, divided only by a thin, natural layer called the “thermocline”. It seems incredible, but it’s just physics! An ARANER-designed diffuser is incorporated into the tank to help with the stratification process, as well. This diffuser can be of a radial or octagonal design, depending on the shape of the tank. The goal is to make the thermocline as thin as possible; the thinner the thermocline, the higher the energy efficiency! The ice storage tank works to accumulate energy by generating ice on cooling coils. The materials involved in this system include an evaporator, storage tank, and two pumps for charging/discharging. So how does it work? In charging mode, water freezes in the cooling coils, with some of the water falling into the tank and most of it staying in the cooling coils as a condenser. In discharging mode, cold water is pumped from the bottom of the tank and it circulates through the cooling coils of the load, where it’s heated. Thereafter, it passes through the cooling coils of the ice generator, delivering it as the final rest of cooled water to the tank. May require more frequent maintenance due to exposure to the elements, adverse weather, and other factors. Can be placed below a parking lot, the foundation of the facility, the basement, or other areas. There’s no doubt that the potential of our Thermal Energy Storage tanks is very high in the market today and in the future. With three unique tanks to choose from, combined with above ground or underground localization, your facility or project will get the customized solution it deserves. In addition to reducing operation costs, capital costs, and the plant’s capacity, our TES Tanks provide the opportunity to be used as supply security systems. Plus, don’t forget that Thermal Energy Storage contributes to greater energy efficiency and power augmentation. For more information on ARANER’s TES Tanks, download the free ebook below.